The Rapid Positioning Intubation Stylet is a difficult airway device for use during video laryngoscopy. Video laryngoscopy and the difficult airway present unique problems. Sometimes even though the practitioner is highly skilled the endotracheal tube just can't be maneuvered properly to perform a successful intubation. 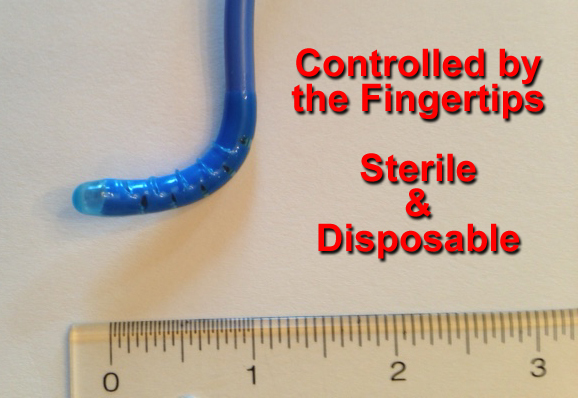 The RPIS Stylet is controlled by the fingertips. The tip can be controlled to FLEX and RETROFLEX to assist in video or direct laryngoscopy. The RPIS Stylet can improve your speed and success rate while intubating a difficult airway. The RPIS accommodates endotracheal tube sizes 6.0 - 9.0 is sterile and disposable.